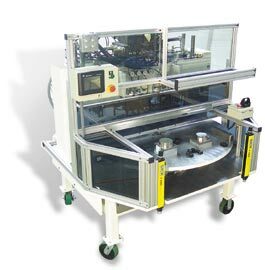 The 2040 Rotary Heat Staking System is capable of many simultaneous operations. One system can often solve production problems that would require multiple assembly stations. In a single cycle, the 2040 Rotary heat staking system can heat stake or heat insert on multiple planes. These processes can be performed on large parts or several smaller parts. Our closed loop thermal control circuit is the key to the systems process control. The 2040 thermal control circuit consists of our standard heater probe with built-in thermocouple and a microprocessor based digital display temperature controller. The cam driven indexer provides the mechanism for the parts to be taken from the fixture loading position to the press position. Maximum clamping force (standard): 5,000 Lbs. Clamping force over 5,000 Lbs.